If you haven't seen this series you are definitely missing out on some great inspiration and creativeness shared here by our fellow bloggers. Day One is here and Day Two is here. 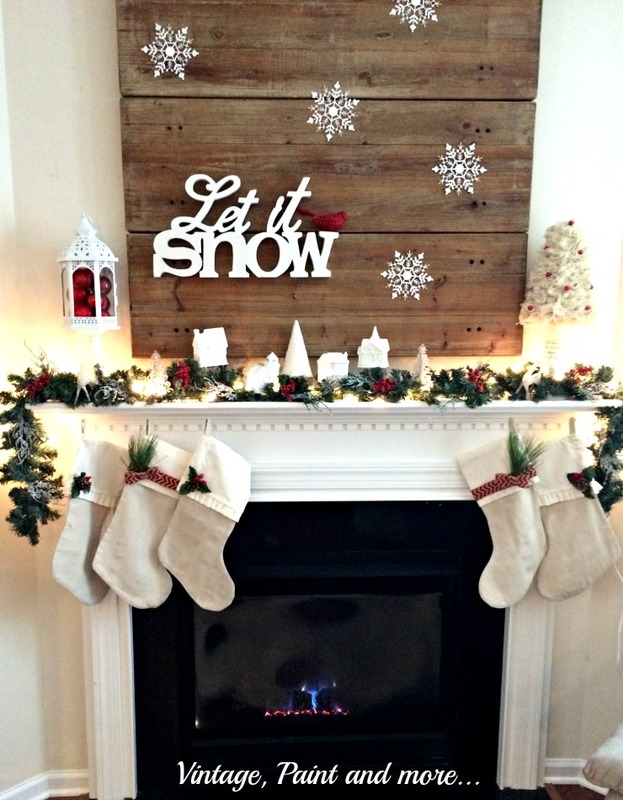 Today I am going to share our Christmas mantel. This year I decided to go back to using more color instead of just the neutral decor of last year. I have to say I am loving all the pops of red among the neutral pieces. 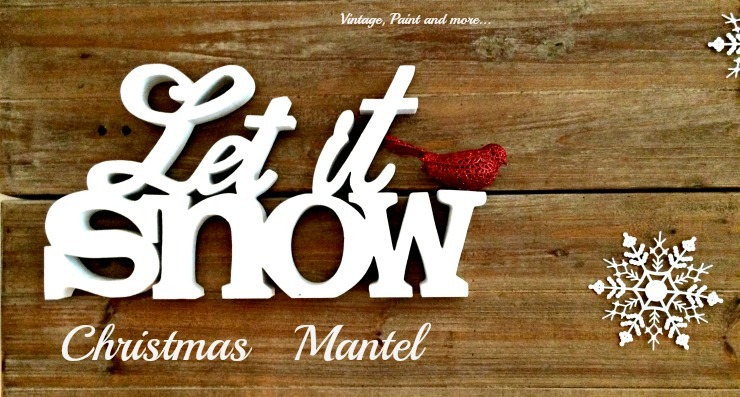 I decided to do a Let It Snow theme because of the sign you see on the wall. My son bought it for me a couple of years ago and it has been waiting for its turn to be in the spotlight. I am actually being quite lazy as it can transition right into a very appropriate winter mantel after Christmas. I hung the sign on our rustic "faux" pallet board above the fireplace. I then added some Dollar Tree snowflakes and a red bird. Then I started on the mantel. 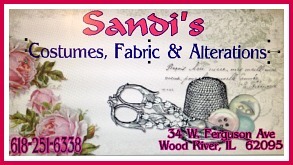 On the left side I placed a large white candle holder with a white lantern filled with red ornaments. Below that you can see a little glittery white reindeer that I got from Dollar Tree last year. 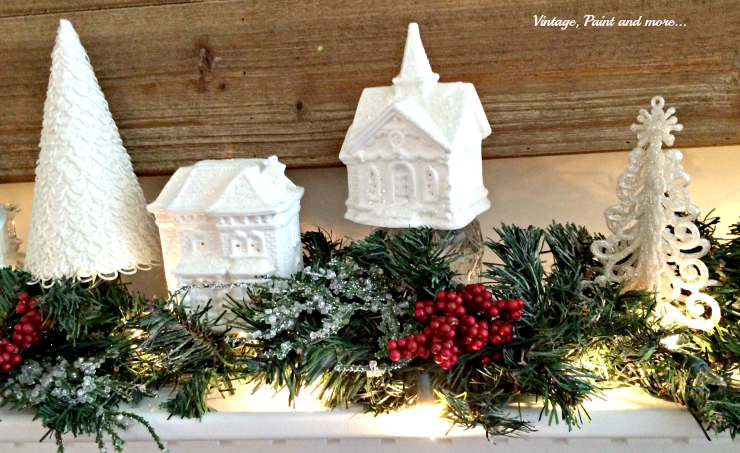 In the center of the mantel I placed our Dollar Tree village we painted white last year. Each piece is put at a different height by setting them on clear candlesticks of varying heights. I placed our smallest button hole cone tree in the center. 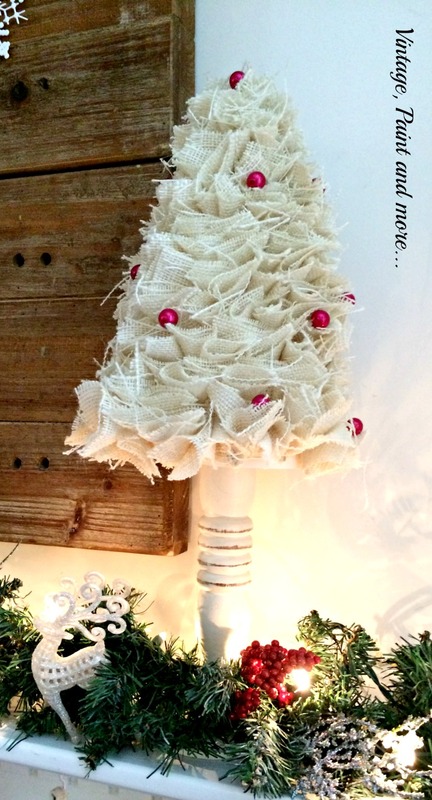 On the right I placed the burlap tree with red beads I made a couple of years ago on a large wooden candlestick. The garland on the mantel is just one of those plain "faux" pine garlands that are quite inexpensive. I added a bit to this to make it look fuller. First I sprayed it with a bit of flocking. Not much - I probably could have done a little more. Then I laced it with a string of mini white lights. After it was in place I added red berries, iced branches, and some more greens to give it some added color, texture and fullness. I love how this little white village is all nestled among the greenery and how the red berries pop against the white. I also added some glittery trees and deer to give just a bit more sparkle. 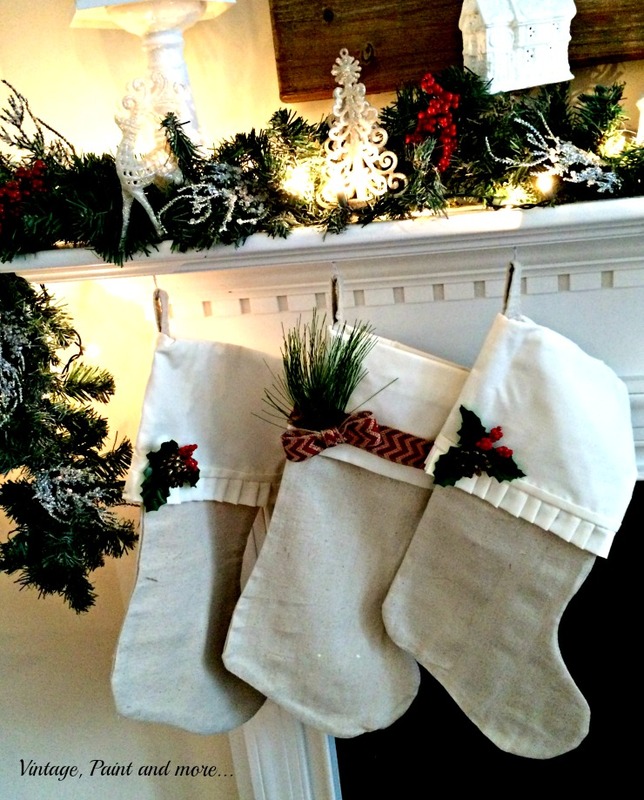 I used our stockings that I made out of drop cloth and sheets a couple of years ago but I changed them up a bit. I wanted some red on them so on two of them I added a red chevron stripe burlap ribbon and a bit of pine twig. The other three I just pinned a holly leaf with a small gold glittered pine cone and some red berries. Now I have some color added to the stockings as well. I am loving how this mantel sparkles with its neutral colors brought to life with just little bits of added reds, greens and glitter. So pretty when it is all lit up. 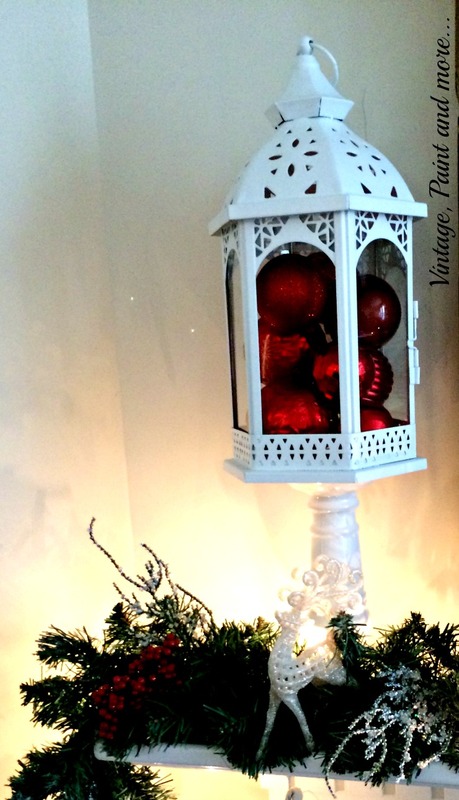 Have you changed your decor this year or are you keeping it the same? 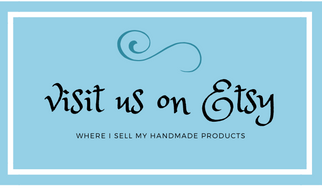 Be sure to visit the links below to see what all the other bloggers in this series have been putting together to share with you. This decor is beautiful and I love the snow flakes. There is two things I envy nowadays...and a mantel is the other...You are having a lovely village in the middle of snow. Let it snow! I absolutely love all the whites with that pop of red! My favorite is the tall tree on the right. I have the same snowflake and reindeer ornaments, too! Gotta love that Dollar Store! Beautiful mantle! Love the crispness of the white against the rough wood. Great job!! Pinning & Tweeting this! Your mantel is absolutely stunning....I LOVE it! Cathy I love it! My favorite mantel I've seen so far. looks so rustic with the wood planks, and i love how the sign is off center. really gives the effect of it all falling as snow. enjoy! It's just lovely! I really like the little white houses, so cute! It is an absolutely gorgeous mantle! Visiting from Thank Good It's Thursday. 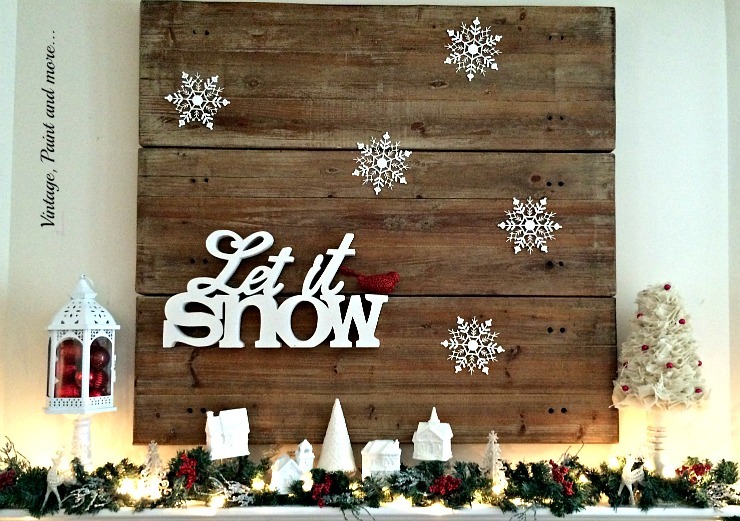 Your let it snow mantel is beautiful! Love the pops of red. The creamy whites with the reds and greens are lovely. Thank you for sharing at Make It Monday. Such an eye catching combination of colors-so beautiful! Cathy, this is simply elegant! Worthy of a top magazine spread. Really. If someone told me they saw this in Better Homes and Gardens or Martha Stewart, I would totally believe it! Pinned it!